Joey Barton is impressed by the way forward Ched Evans has taken to the captaincy at Fleetwood Town. The Sheffield United loanee, 30, is expected to wear the armband for the fifth time at Barnsley on Saturday. 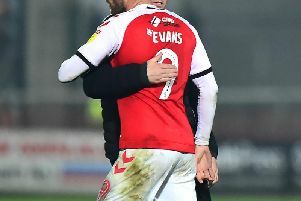 Ash Eastham assumed the captaincy in the absence of the injured Craig Morgan until Barton entrusted the job to Evans a month ago. The Town boss spoke then about spreading leadership throughout the side, though he looks to be sticking with Evans. Barton said: “Ched leads the line in many ways. “I felt he was outstanding on Saturday (scoring both goals in the 2-2 home draw with Southend) and has been since he took the armband. “We were toying with the idea of moving it round, but since he has had it he has really grown in the dressing room and taken on the mantle of being the leader. “It has also freed Ash Eastham up. Ash is a very good lieutenant. “I think he is someone who maybe has to learn and grow into the captaincy. “Since he has been at this club he has had Nathan Pond, a fantastic leader. You see the flag on the stand: ‘Pondy, captain, leader, legend’. “Maybe we have just got to let Ash slowly grow into that role. “He is somebody we want at our football club because he brings so much to the club. Eastham has come off the bench in Town’s last two matches, with James Husband partnering Harry Souttar in defence.